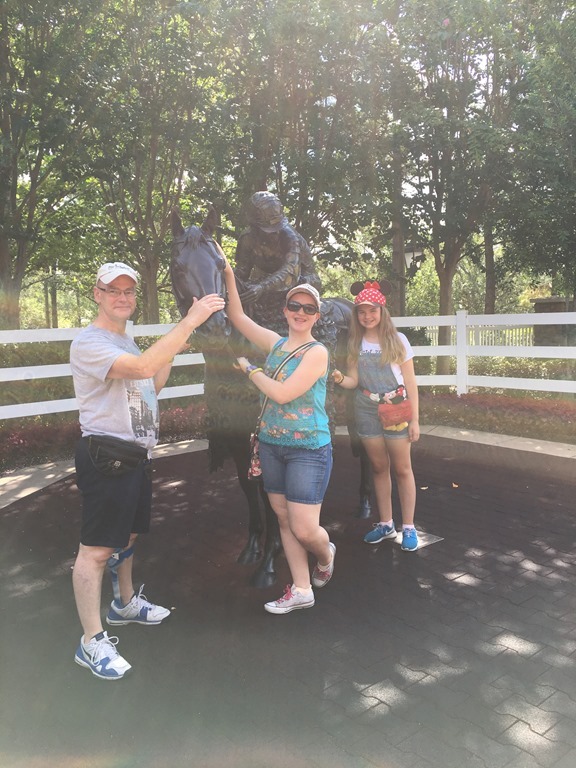 We had arranged to collect our hire car from the Hilton Lake Buena vista, which is just across from Disney Springs, and I had thought an easy walk from Saratoga Springs. However, after last nights lengthy jaunt, I decided we needed a plan B and so we booked an Uber. 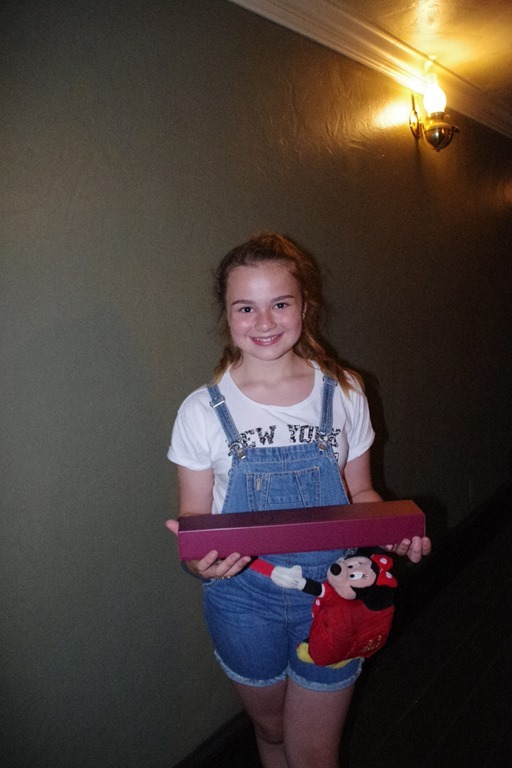 It was the first time we have used Uber, and it was super easy, and what I particularly liked was it came right to our block, whereas I think the cabs all leave from the Reception area. We were supposed to be collected by Prince who looked like a man in the photo, but a lady turned up. She was very nice but not from the area, and she got lost. Which is quite impressive considering it wasn’t a long journey. We did about 3 u-turns but eventually we arrived at the Hilton, and we made our way around the back to the Avis desk. We had a bit of a disaster at the Hertz counter last time but this was quick and easy. Helped I think by having signed up for the Preferred club. The voucher I printed out had the wrong number on it (not sure how as I’d only printed it the day before we flew, but I know BA had already changed it at least once, so I can only assumed they had changed it again. However, they quickly found our reservation using our preferred account. We had booked an SUV but there were none in, a risk with the smaller hotel locations . He offered us a full size instead, then seemed to suggest we might be happy with a mid-sized but we said we’d have the full size thank you very much. We can go back and change it for an SUV later if we want. The car is a Ford Fusion which is a hybrid electric car. It’s pretty big, and Phil has been driving a VW Up lately, so it took a little while for him to get used to it, both the size and the electric silence which feels a bit odd. Our first stop is Target, which is kind of in the wrong direction for the rest of the day, but we like Target and we know there is one on the 192, so that’s where we go. Just as we arrive the heavens open, it was torrential but it only lasted a few minutes and so we waited in the car for it to pass. We had a good mooch around Target, buying some snacks for the room, Molly was extremely pleased to spot a particular range of makeup (ELF & Wet N Wild) and so she stocked up on that. We spent about $90 on not a lot. Not sure how that always happens, but I am sure they were all bargains! After we left Target, we went up to our new hotel, the Rosen Inn International. I’ve seen this mentioned on theDibb a few times, and we wanted an inexpensive base near Universal for a few days. I’d been tempted to stay at Universal, and certainly it would have been lovely, but we couldn’t justify the expense, so we are trying the Rosen Inn. We found it pretty easily, and checked in. We have a nice room with 2 double beds, a fridge and a microwave in the room. For what we paid it’s very nice. We dropped all our stuff off, and went to find some lunch. I knew there was a Friendly’s in the area, so we decided to go there for lunch. It was just down I-drive, but due to some interesting navigation we had to take a few U-turns before we made it there. 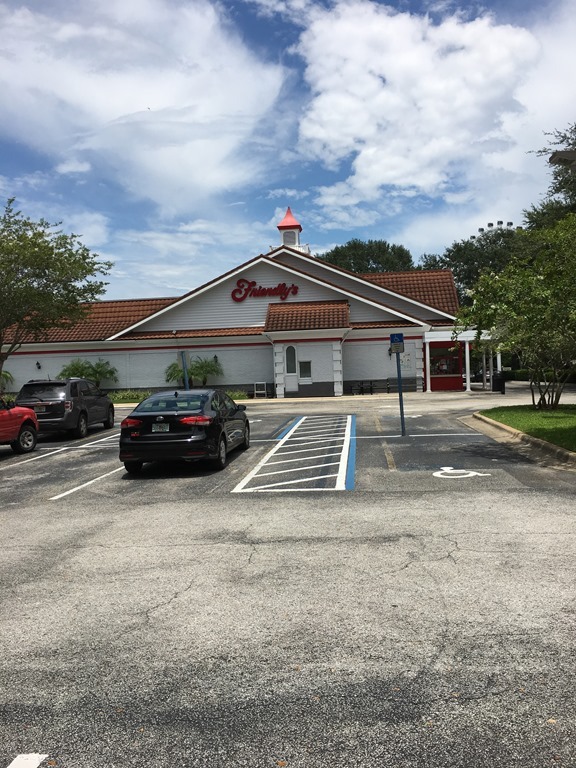 I remember Friendly’s as a place we always wanted to go to when we were kids, but I’ve not eaten there since the 80s. 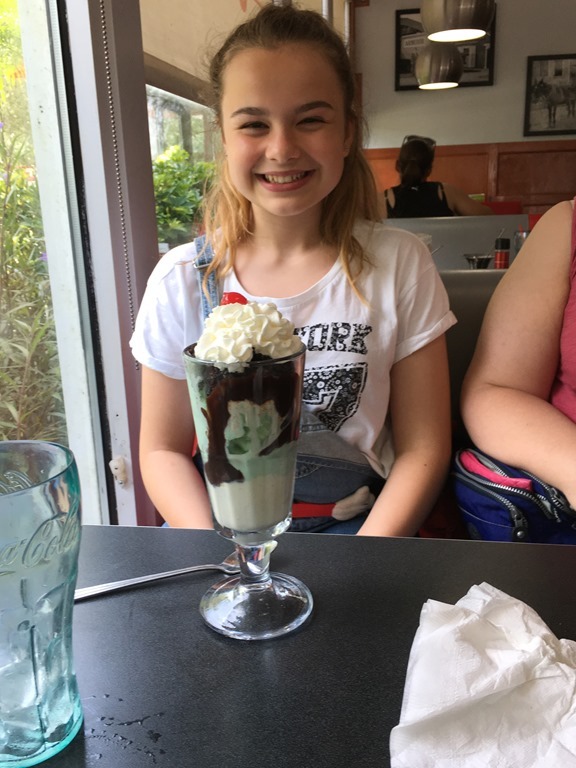 We decided to have small meals, so we could have big ice creams. After lunch, it’s time to head upto Universal Studios and Harry Potter. I’ve been hoping we would be able to fit this in so was very excited that we were actually going. The plan is to go in for the evening and just look around, soak up the atmosphere and not worry about getting on the rides. 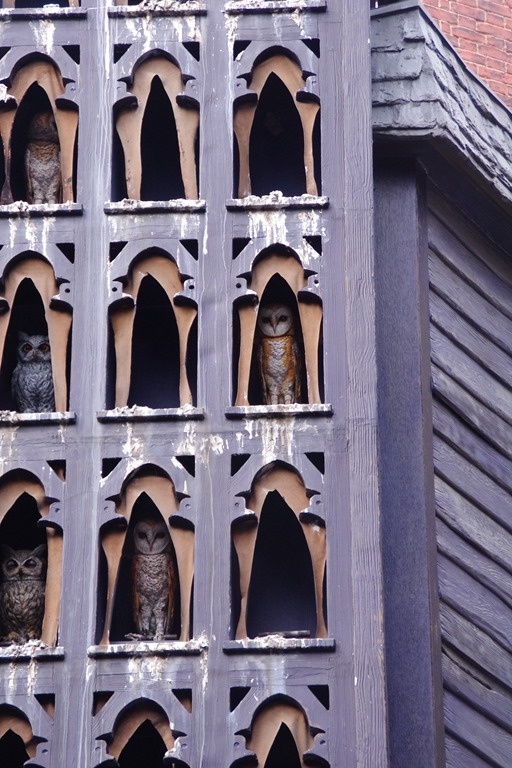 Im hoping it will be less croweded in the evening and we will actually be able to see the details. We parked up on the roof of Spiderman, and walked the miles through Citywalk to the park entrance. I kind of get why they do this, but it has never had the effect of getting us to spend money in Citywalk. On the way in, we want to be in the park asap, and on the way out we are tired and ready to go home. Anyway, we make our way to the entrance and collect our tickets from a Will Call kiosk. It was pretty straightforward, and we entered the park about 3:30. The sky looked quite dark and ominous but we pushed on regardless. We walked straight past everything else, as we had one destination in mind. 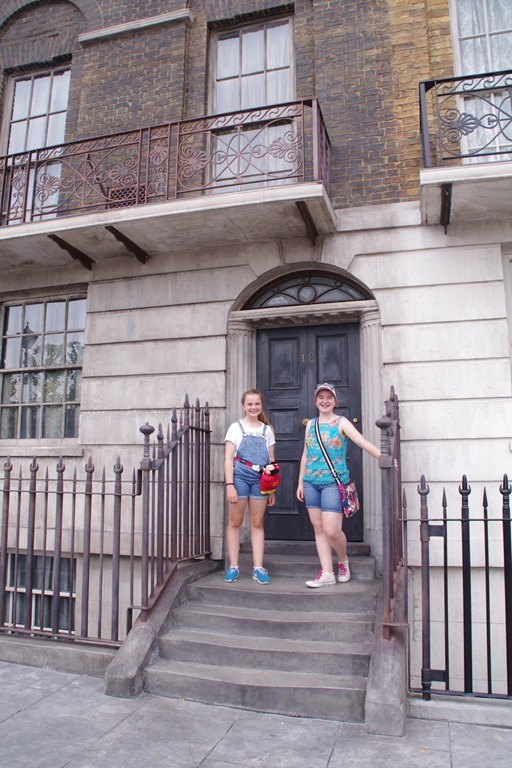 We take a quick picture about Grimmauld Place and then we walk into Diagon Alley. Wow, what a place. Everywhere you look there is something to see, I just want to soak it all in. It’s quite busy but you can still look around, it’s not so busy that you can’t walk around. 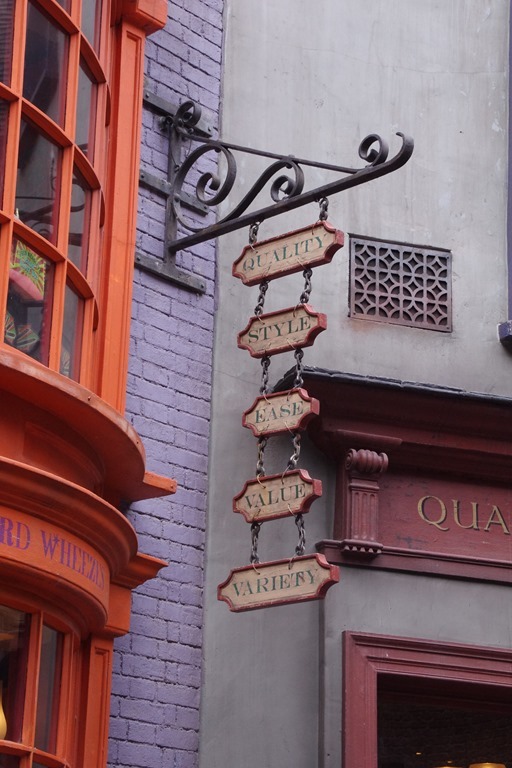 Last time we visited Hogsmeade, we never got into Olivanders since the queue was so long, so when we saw there was no queue we decided to go straight in. 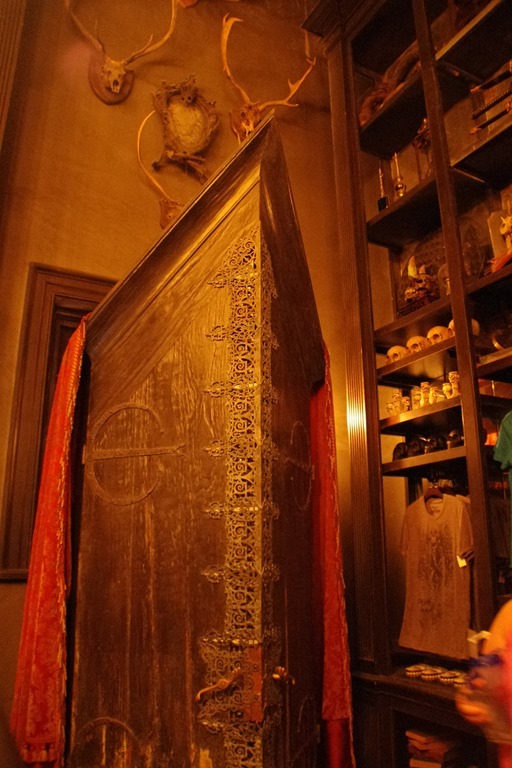 Well, we went into the main room to meet Olivander, Molly was picked to choose her wand. Unfortunately, I totally failed in getting a photo of this, but it was pretty cool, especially as Molly had no idea what was about to happen. She picked an Ivy crust with a unicorn hair centre, however, she was pretty sure that wasn’t the wand she wanted, so we didn’t actually buy it. 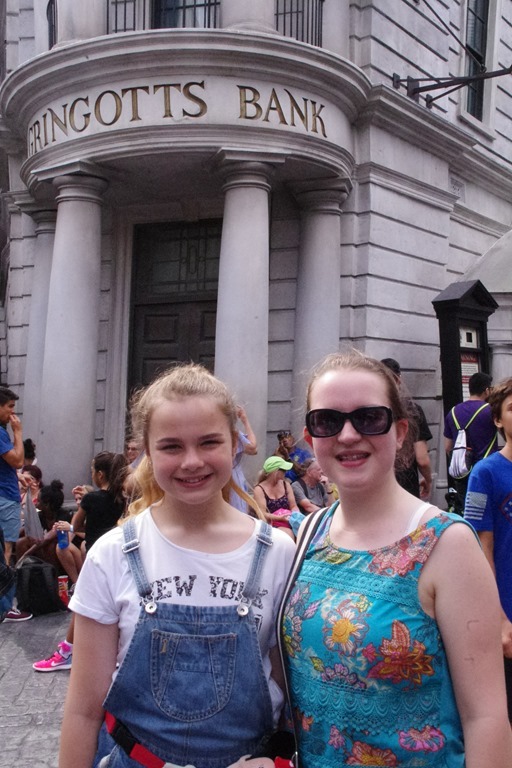 Gringotts was showing at 80 minutes which is way longer than I would usually wait, but we really wanted to see the ride, so we decided to wait. Before we could ride, we had to put everything in a locker which seemed excessively traumatic. We had a camera bag which was bigger than the lockers, so we had to find a large locker and they were all taken. We did eventually get a locker and get everything stashed but that must have taken half an hour. We went into the main line, and headed outside, but within 25 minutes we were in the main bank area, so it didn’t feel too long at all. The detail in here is great, the goblins look right at you and it gives you the creeps. 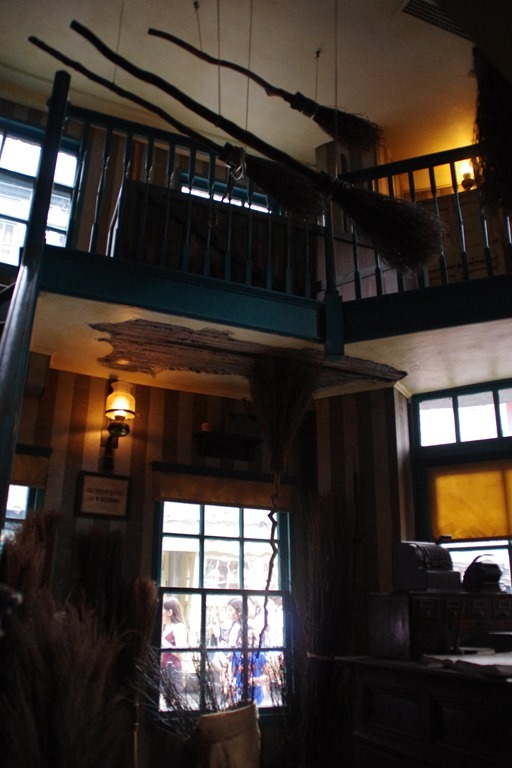 After this hall, you head downstairs and then upstairs, I do find Universal have a lot of stairs in the queuing areas. It must be difficult if you can’t manage the stairs. Eventually we get to board, and we are off. It’s a great ride, I really enjoyed it. It was very smooth, and the effects were amazing. Definitely worth the wait. 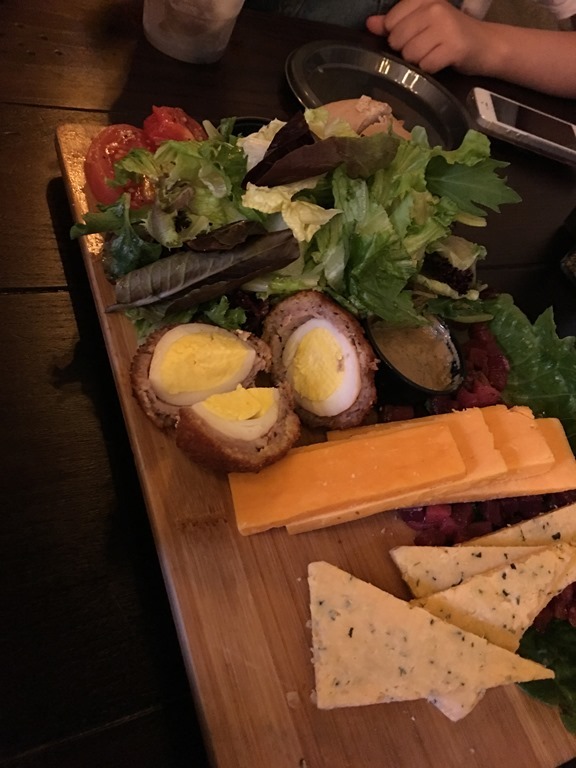 After the ride, we decide to have something to eat / drink at the Leaky Cauldron, we get a huge ploughmans which we share between us all, plus a butterbeer and a lemon squash. The ploughman’s was plenty big enough for all of us and made quite a nice change from all the pizza and burgers we seem to have been eating. 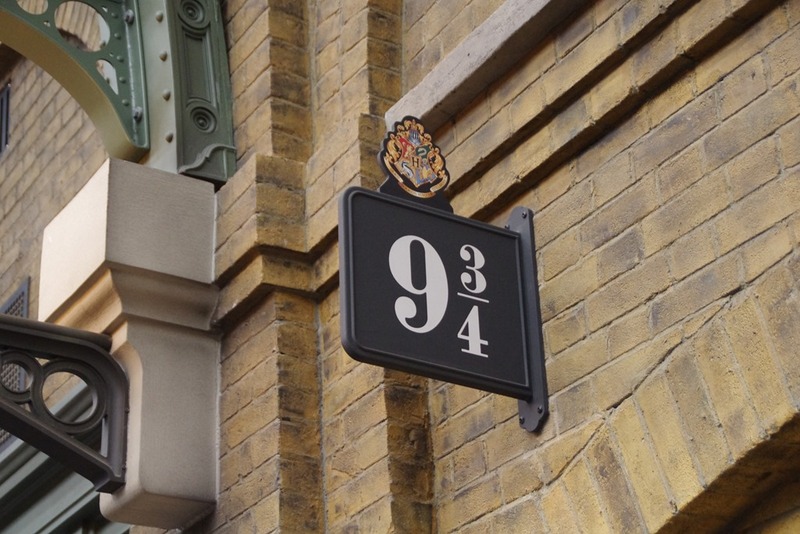 We’ve had a good look around Diagon Alley, so we decide to take the train to Hogsmeade. We walk around to Kings Cross, and its so creepily detailed, it feels very much like a real train station, although perhaps a bit smaller than Kings Cross! On the way through the station you pass onto platform 9 3/4, and there is supposed to be a cool effect where this happens. Unfortunately, it wasn’t very busy and for some reason I just didn’t see the effect at all, I just walked on through. Katie had seen it and said it was brilliant, so I was a bit disappointed. 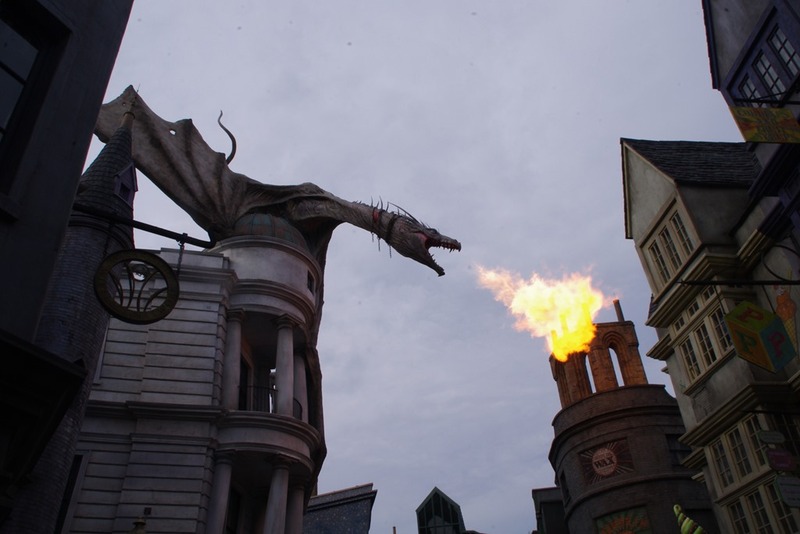 The train is really cool, and we are soon in Hogsmeade. Last time we were here it was so busy we could hardly walk and we couldn’t get into any of the shops, as you couldn’t physically get into them, so it was nice to see it was much less crowded and we could have a good look around. 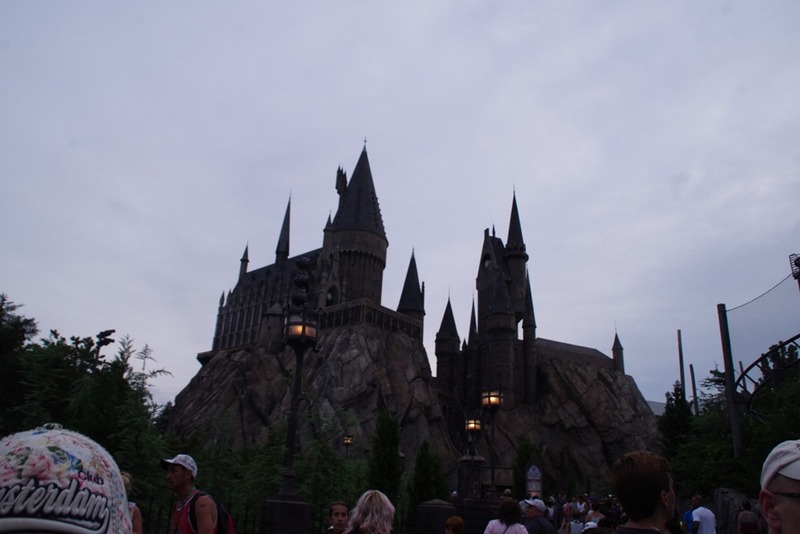 We walked up to the Forbidden Journey, and decided to ride single rider so that we could get on the ride without a long wait. We dealt with the locker situation again, this time we had to get 2 lockers and just managed to squeeze the camera bag into one of them, and the other bags into another. It’s a palava and gets to be a bit frustrating as the locker areas are just rammed even though the rest of the park was ok. Anyway, bags stowed, we go through single ride and basically walk straight onto the ride, which was ok but actually the castle is quite cool and we missed that, so I think we need to go back and just walk through the castle to look at all the details. This ride is great too, although it was a big bumpier than I remembered. 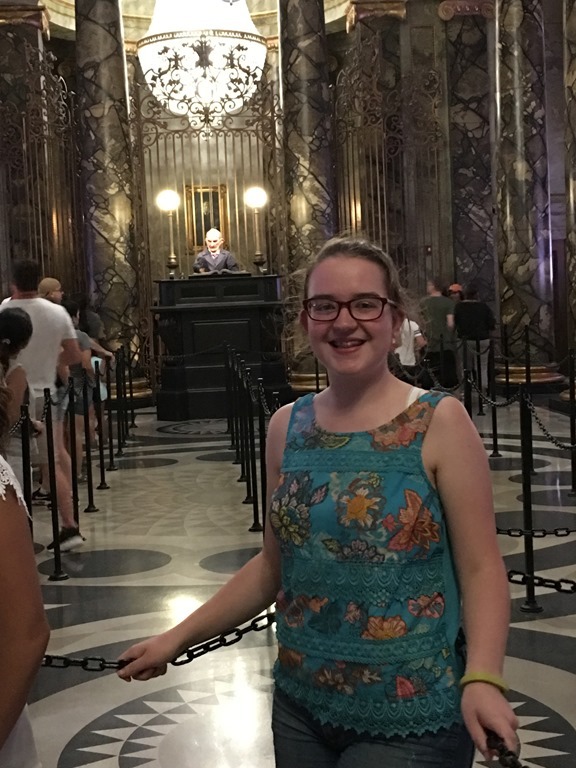 I was quite impressed with how much we were managing to achieve, we’d ticked off all the major Harry Potter rides in just a few hours. 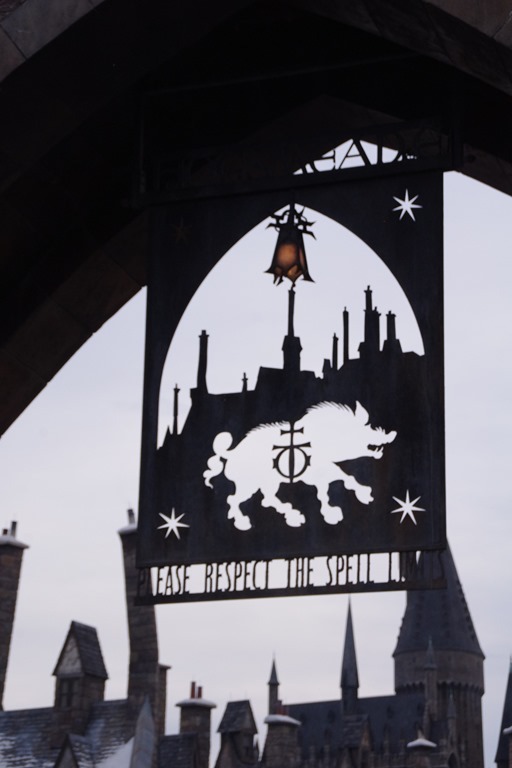 We have another look around Hogsmeade, and Molly tries to get into Zonko’s joke shop. 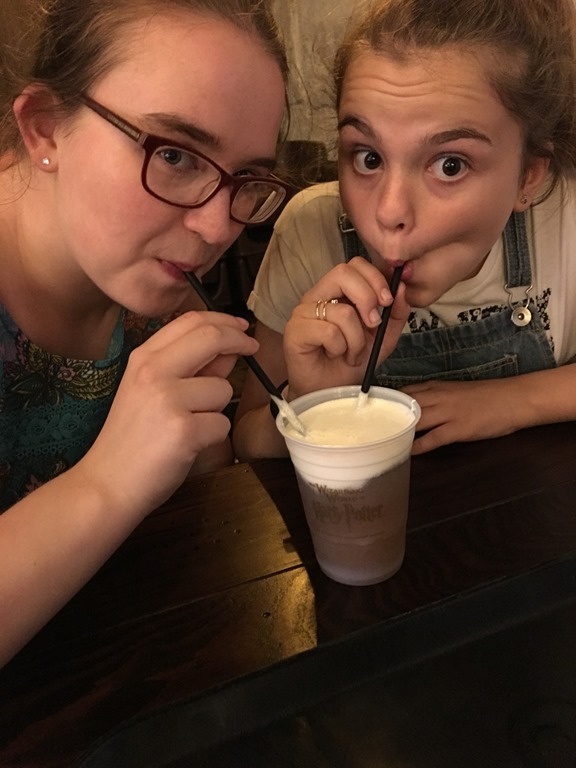 We can’t find the entrance, so we ask the cast member who tells us to look inside, the joke shop is actually Honeydukes, and ‘that’s the joke’. She felt a little silly but he said it happens many times a day. 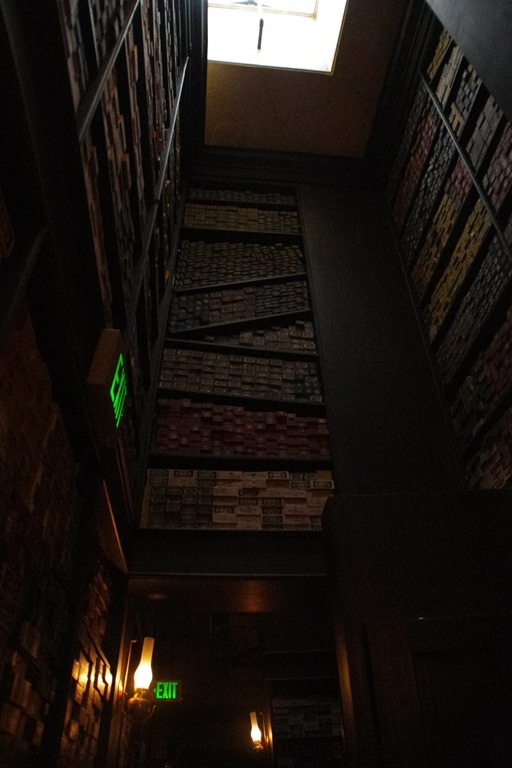 Molly wants to buy a wand, so we go into Olivanders. 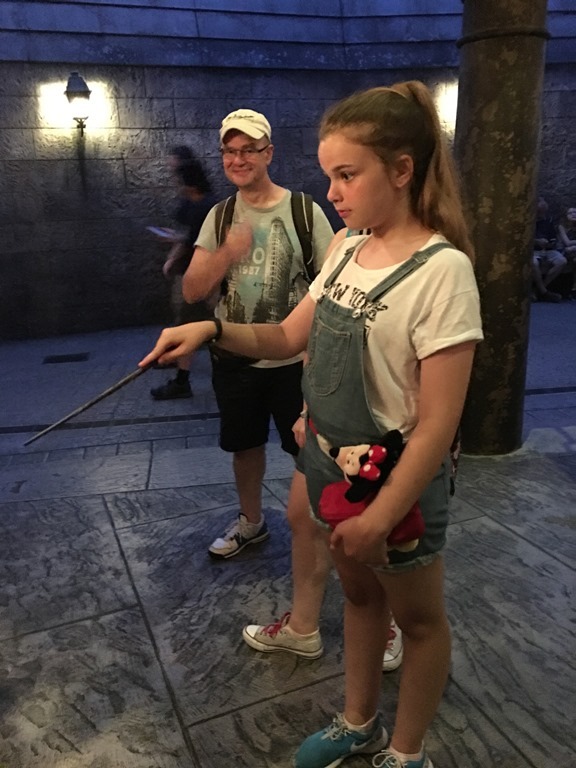 We hadn’t realised that the interactive wands you can use in the parks are the same as the wands in Olivanders, for some reason I had thought the interactive wands were a specific model, but you can get almost all of them as interactive ones. 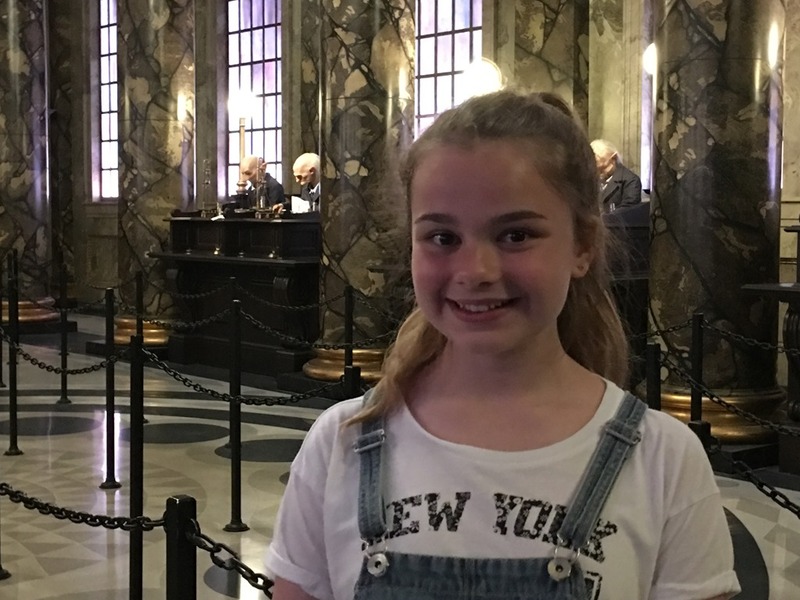 I say almost as Molly like Xenophilius Lovegood’s wand but they don’t do it as an interactive one, so she spent a while looking for a second choice and decided on Hermione’s. 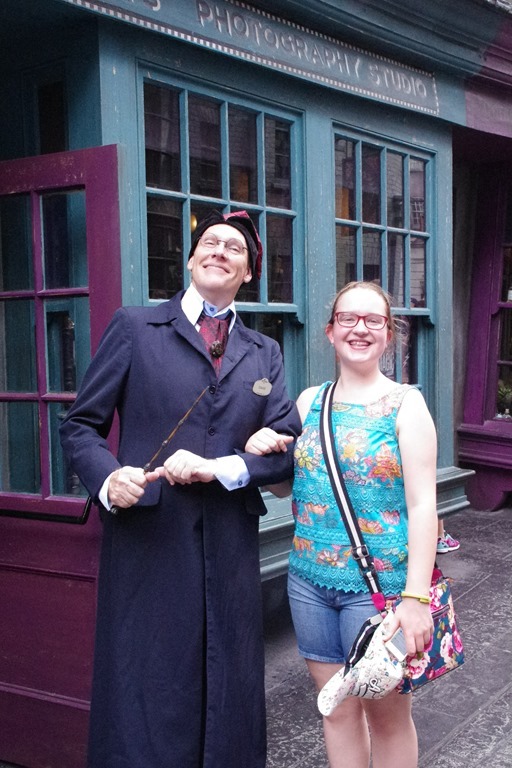 After she had her wand, we went out into the park and she tried to cast some spells. It was quite hard, and she struggled getting it to work. I was thinking this was going to be a bit of a disaster, but she got the hang of it, and she tried a few more and got them working really well. We are getting tired, so we decide to get the train back and then head out of the park, The train ride back is very similar to the ride over but with a different story, and then we start to head around the lake to leave the park. We are just passing the Simpsons area when they announce that it’s nearly time for the nighttime Spectacular, so we decide to and have a drink and watch the show. It is strangely quiet compared to a Disney nighttime show. We are able to grab a table right on the lake just a few minutes before it starts. The show is a series of clips from Universal Movies projected onto a water screen. It is ok, but really only ok. I certainly wouldn’t make any effort to see it again. We then leave the park and walk back to the car. It’s about 10pm and the car park feels about 100 miles away…. We do eventually make it to the car, and back to the room. We don’t seem to be very good at this relaxing days, its another late night.